Two Tibetan men, both named Jinpa, meet on a deserted road in the remote Kekexili highlands of Qinghai province. One (Jinpa, the name of the actor who plays him) drives a truck; he’s just run over a sheep. The other (Genden Phuntsok) is a hitchhiker, and explains he is on a ten-year quest to find and kill the man who murdered his father. 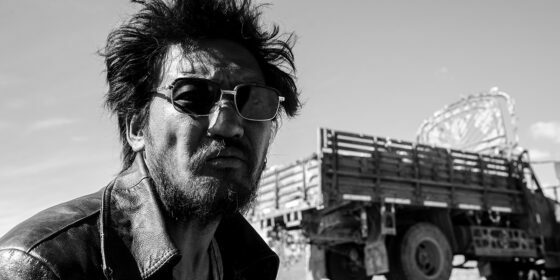 Truck driver Jinpa, a wild-maned, hyper-masculine figure decked out with permanent sunglasses and bulbous necklace, is obsessed with a tape of a Tibetan-language tango-beat version of O Sole Mio. Jinpa the dashingly handsome would-be avenger, meanwhile, has the taciturn moral aura of a jianghu swordplay hero. Jinpa is an extraordinary departure from the realist narratives that have made Pema Tseden’s works celebrated at film festivals around the world (this is his sixth feature). It is a fable, a Tibetan road movie, and a tribute to classic Westerns all at once. The stylized photography by the gifted young cinematographer Lu Songye juxtaposes lonely travellers against the bleak, boundless mountain scenery of Kekexili (no prettifying of Tibetan highlands here). Also new for Pema Tseden is the film’s tense, ominous rhythm that seems to be holding back the about-to-be unleashed energy of a frenzied storm. As per genre requirements, there is even a humorous saloon standoff: here it’s in a Tibetan mountain teahouse presided over by a wittily seductive barmaid/boss (Sonam Wangmo). All this is erected on a blood-red scaffold, a mythic-epic canvas that expands the range of Pema Tseden’s cinematographic vision in exhilarating and provocative ways. A moral tale that embeds pent-up violence in a ritually inscribed cycle of revenge and redemption activates undercurrents (best left implicit) that clearly and quietly signify in a Tibetan/Chinese context. But Jinpa’s ferocious, visionary power is onscreen for all to see.